Very little, if anything, is known about Weyrauch apart from his authorship of this song. It was published as Adieu! in Paris, circa 1835. The title page mentioned ‘Mr. 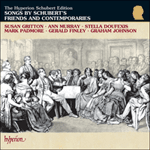 F Schubert’ as the composer with ‘paroles françaises’ by Mr. Bélanger, and there is a dedication to Mr. A Nourrit (the famous tenor who did so much to advocate Schubert’s lieder in France). The song actually dates from 1824, and it was privately published by its composer, Weyrauch, with the title Nach Osten, and a poem by Wetzel. We do not know whether Weyrauch played any part in the original falsification, or its eventual discovery. The music was re-imported to Germany in 1843 under Schubert’s name as a solo piano piece. Even Schumann seems to have believed the song was by Schubert himself. 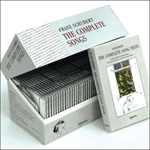 No doubt on account of its popularity the song was reprinted in Volume 6 of Max Friedländer’s Schubert Edition for Peters (1873) together with a warning that the song had been incorrectly attributed to Schubert. As the only song in French by even a phoney ‘Schubert’, and a lyrical manner that suited the contemporary taste for the cavatina, it received many performances—and Schubert’s name was usually given, willy-nilly, as the composer. In this music one can hear a prophecy of the long-breathed melodies of Gounod (said to be influenced by Schubert); songs like Fauré’s Après un rêve were the final flowering of a particularly French genre initiated by Adieu!. Ô toi! seul bien que j’aime! Sans moi retourne aux cieux! the moment of our farewells! return to the heavens without me! Farewell, you will wait for me.